The Federal Government has issued special classes of driver's licenses where inter-State travel is part of the job, and unlike almost every other country in the world, has never endeavored to issue "standard" driver's licenses. In the early 1900s, Massachusetts and Missouri were the first States to require that its residents obtain a license to drive a car. Over the years, all of the States followed suit, with first license ages being undetermined in some States -- anyone who could walk and talk could apply -- the usual age became more or less standardized amongst all States at 17 years of age, with 15-17 having special circumstances for application. Whatever age you were when you received your 1st license, we're certain you were as thrilled as the gift recipient you're shopping for today. Our new driver ornament collection can be personalized to mimic the real thing, complete with State of issue, year, and the driver's name. 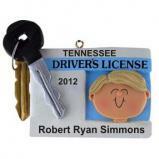 In addition to the drivers license Christmas ornament design, we offer first license ornaments as license plates which you can personalize with the make and model of his or her first car. We offer ornaments for boys and girls, younger and more mature, blond and brunette. All of our new driver's license Christmas ornaments arrive presented in our classic black velvet bag, ready to make a wonderful and memorable personalized gift.